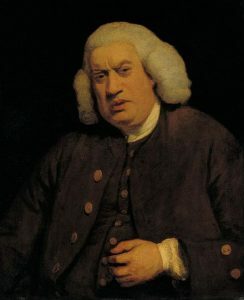 I was taking my Friday night bath when I was visited by the ghost of writer Samuel Johnson. I wasn’t embarrassed because ghosts are no longer body identified. The body for them is like a hat you throw on just before going outside, out of habit. I lay in the tub, comfortable in my wet nakedness and said it was good to meet him. I always say that to every ghost I meet because I always say this to every living person I meet. I was raised to be nice no matter what.